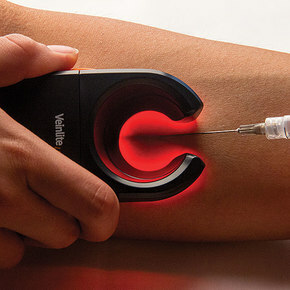 The Veinlite LED+ illuminates a patient’s veins with orange and red light, making it much easier for a clinician to insert a needle. 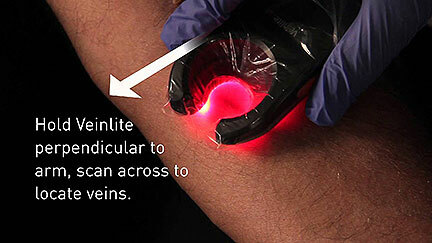 The Veinlite LED+ fits over the patient’s arm, where the array of 22 orange and six deep red LEDs illuminate the veins in high contrast for easy location. The LEDs can be tuned to suit different ages and skin tones, while the C-shape of the unit stretches the skin to keep the vain steady while the needle is inserted. The Veinlite LED+ is also rechargeable, requiring only three hours for a full charge with a battery life of three to five years.